For the past few years I have been intently following the Formula One - a sport my Grampy loved. When I was young I could never understand the fascination of watching cars go round in a circle. As I got older and began to understand how technical and tactical the sport was, I became much more interested. 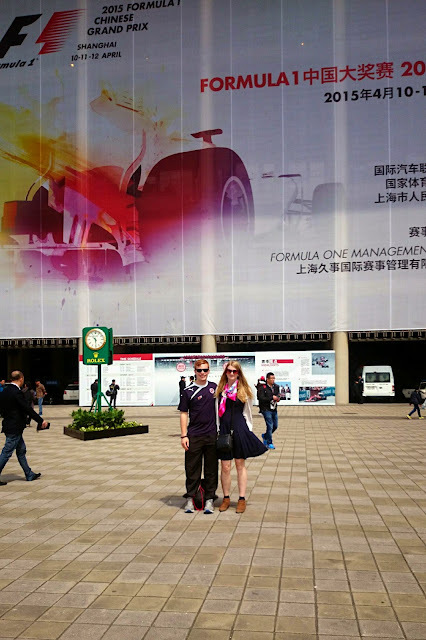 When I realised that I would be in Shanghai at the same time as the Chinese Grand Prix, how could I not go? We started the day very early, ensuring we got there before the crowds to collect our tickets. The metro took over an hour from our hostel, but we knew we were going the correct way as more and more fans boarded the train, wearing Ferrari and Mercedes hats. Arriving at the metro stop - directly behind the Grand Stand - was amazing, the stadium was much bigger than I expected (having only spent time at football stadiums). Outside the stadium we found loads of memorabilia, cars, advertising and people flogging ear plugs! Inside the stadium were stands showcasing the newest Mercedes and Porsche's. I know what your thinking, Porsche do not race in the F1, but they were there for the Porsche Carrera race that took place in the morning. Not wanting to miss a single race, we headed for our seats. Thankfully, the auto assigned seats were kind to us, giving us a view of over half the track! Not long after sitting down the Porsche race began, the noise was unreal! I am not certain whether the stands amplified the sound or whether what we heard was raw! The Porsche race was mental - so many cars started and a lot of them didn't finish! It seemed more like rally racing than Formula 1 style - so much action in 12 laps! 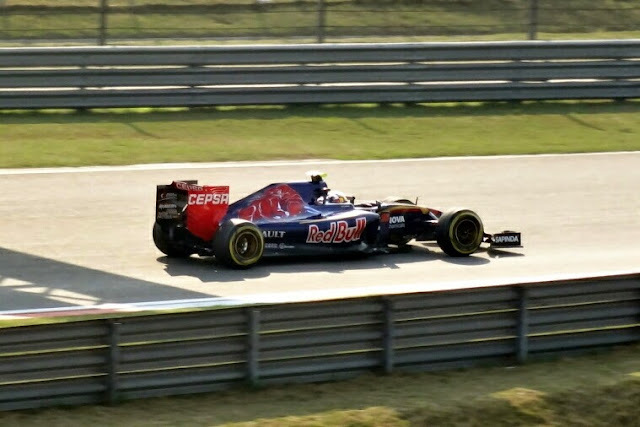 Unfortunately it wasn't the Porsche SuperCup, so I didn't get to see another one of my Formula One idols - Mark Webber. At 12.30pm the track parade began - drivers boarded a bus and moved around the track, waving at fans and being interviewed for the live show. 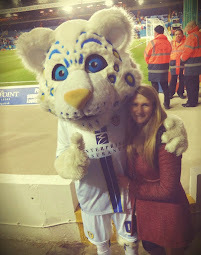 Being this close to people that I regularly see on the TV was amazing - it seemed so surreal! 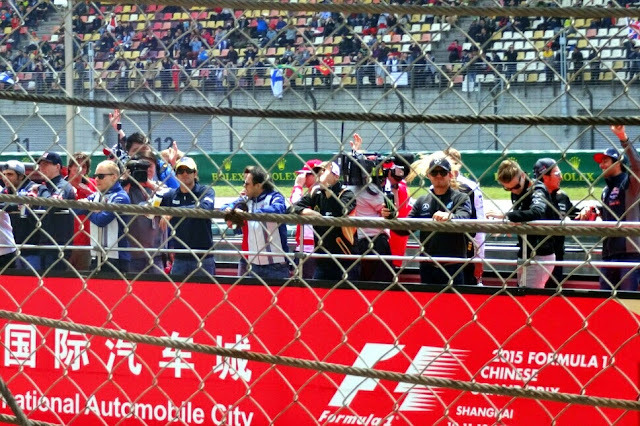 Screaming fans for Alonso and Massa were all around us and the drivers definately heard! 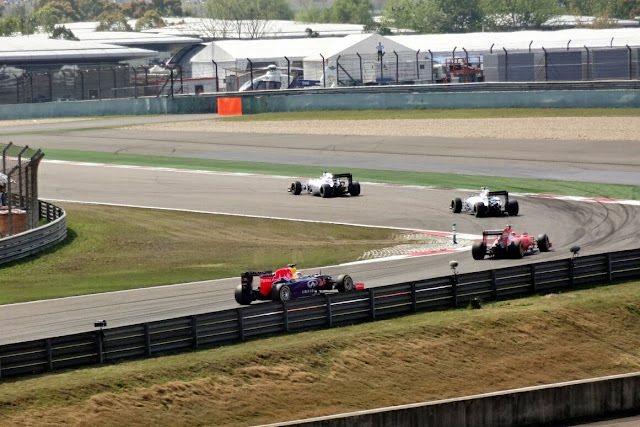 At 1.30pm we had our first glimpse of the Formula One Cars moving around the track, unknowingly to me, they do a couple of laps before lining up on the grid. 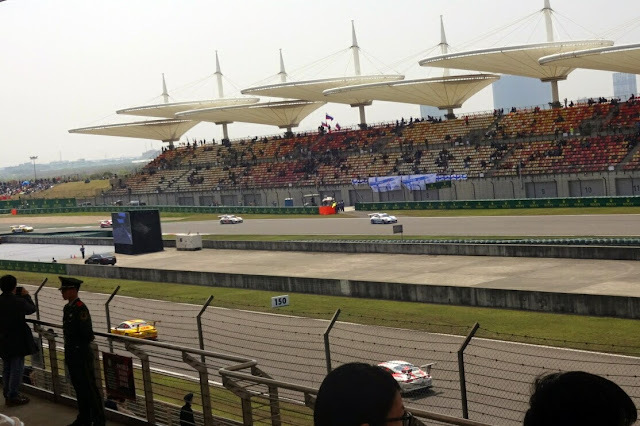 The noise wasn't as loud as the Porsche racing, but these cars weren't going at full speed. The way the F1 cars move were far more elegant than the Porsche's also! Finally, at 2pm, the race started. The excitement of the first lap was unreal. We had a screen directly in front of us that allowed us to watch the parts of the track we were unable to see. 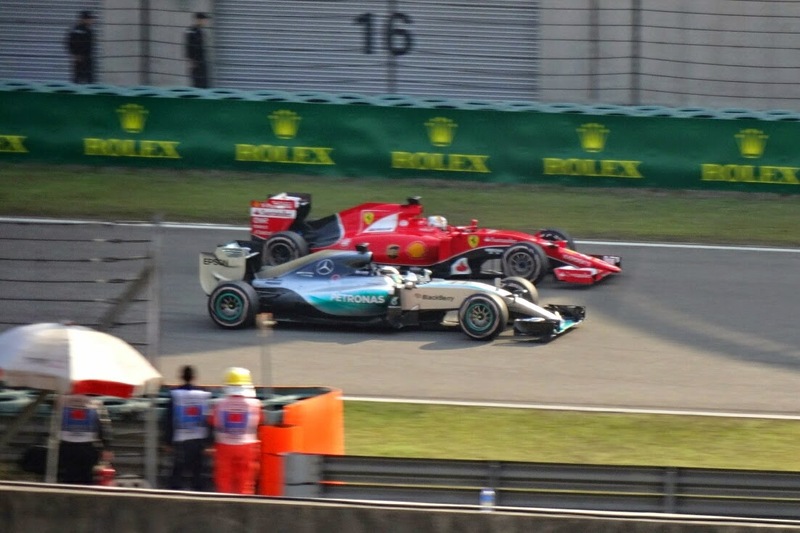 By the time the cars got to us (barely a minute into the race) Lewis Hamilton had already started pulling away! 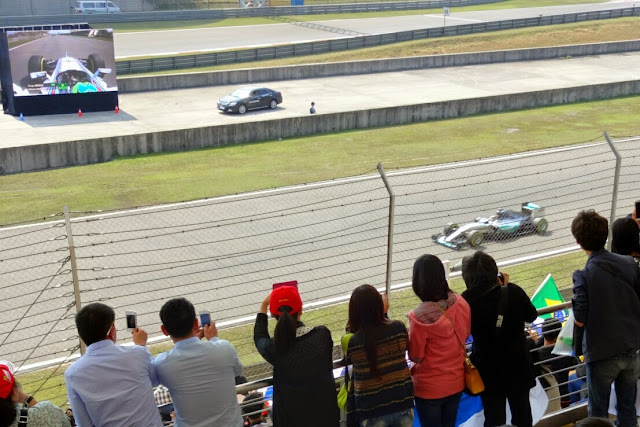 The crowd went crazy as the cars went past, with people cheering and screaming and many more taking thousands of photos, trying to get a close up of their favourite driver. It was so hard to follow the race on the TV aswell as watch the cars go past you - it was just too exciting. The noise these cars made, now going at full speed, was unreal. It literally sounded like a jet fighter was taking off next to you. The aerodynamic shape of the car gave a much more distinctive sound, rather than just that's the Porsche's engine. The race itself was one of the more boring F1 races I have seen - very little drama and the top three finishing as they qualified. However, the lack of excitement in the race did not detract from the beauty of the day. It was lovely to see Sebastian Vettel catching the front runners again - even if he does look strange in that Ferrari red. Obviously (for anyone who knows me) the highlight was seeing Nico Rosberg, who lead for a whole lap whilst Hamilton pitted! 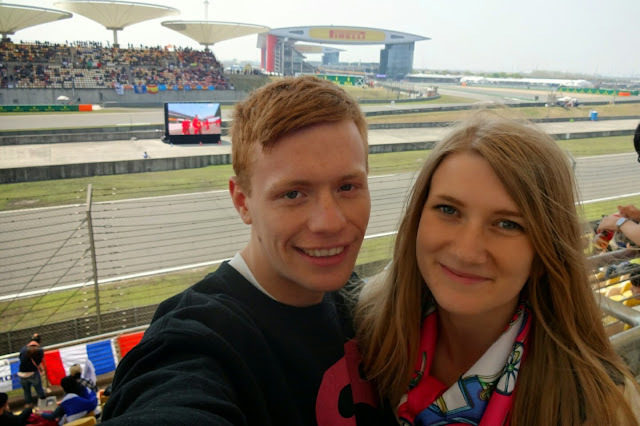 This was (hopefully) my first of many experiences of watching Formula One live!